Architectural perspective drawing of the winning design for the World War I Memorial in Washington, D.C. The incredible service and sacrifice of those who served in World War I a century ago finally will be honored in a memorial in the nation’s capital, said Edwin Fountain, the commission’s vice chairman. Fountain, the grandson of two World War I veterans, announced the winning design concept at an event at the National Press Club here. The winning concept is “The Weight of Sacrifice” by 25-year-old Joe Weishaar, a yet-to-be licensed architect, and veteran sculptor Sabin Howard. The design concept met the challenges of creating a concept for such an important memorial, Fountain said. Those challenges, he explained, included finding an appropriate way to honor the magnitude of the service and sacrifice of the nearly 5 million people who served and the more than 116,000 who died. In addition, Fountain said, the design concept had to work into the surrounding landscape, complement the iconic architecture and design of historic Washington, and serve as a city park. 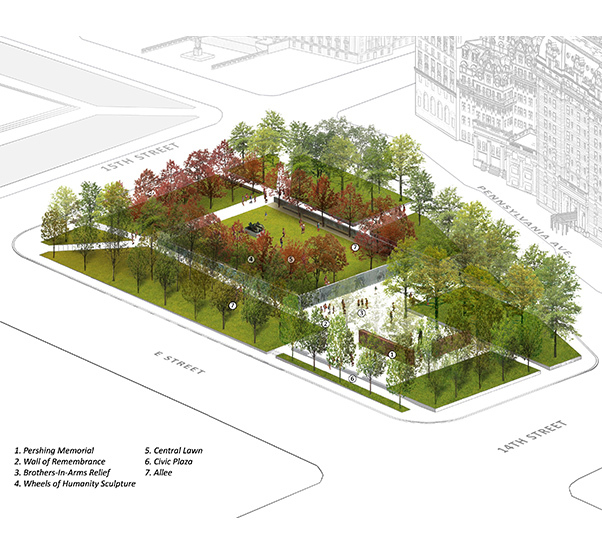 The memorial will be located in Pershing Park, near the White House. While the National Mall, where other war memorials are located, would be the preferred location, a law prohibits new construction on that expanse, Fountain said. Besides serving as a permanent tribute to the service members, the memorial is meant to educate Americans and inspire them to learn more about the largely overlooked war that has profound influence to this day, Fountain said. Those who fought and died in World War I did so with the “same courage and tenacity and sacrifice” as veterans of wars that have national monuments in Washington, Fountain said. Those who served in The Great War, he added, withstood the inferno of artillery barrages, and went down to the bottom of the sea in their ships. “They fell from the skies in burning wreckage of airplanes, and they charged out of trenches across open fields and into woods and up hills that the enemy had spent years fortifying to defend,” he said. The service and sacrifice on such a scale must be commemorated, he said, adding it would be an injustice to not have a national memorial in Washington for them. World War I began in July 1914 with the assassination of Austrian Archduke Franz Ferdinand. It ended with the armistice on Nov. 11, 1918. There are no living World War I veterans, Fountain noted, but descendants of those who served in the war have supported the efforts for the memorial. Sandra Pershing’s late husband, Jack Pershing, was the grandson of World War I Army Gen. John J. Pershing. The memorial is of tremendous significance to her family and the nation, she told the audience at the Jan. 26 event. While noting there is a statue for Pershing in Washington, she said her husband felt strongly there should be a memorial to honor the millions of others who served. “Today we’re going to start to restore the honor that has been so long in coming,” she said. The winning concept will go through an extensive design review from a number of agencies, including the Commission of Fine Arts, the National Capital Planning Commission, and the National Park Service, Fountain said. The commission hopes to begin construction on Veterans Day 2017, with a possible dedication on Veterans Day 2018. The commission is looking to raise $30 million to $40 million for the memorial, Fountain said.